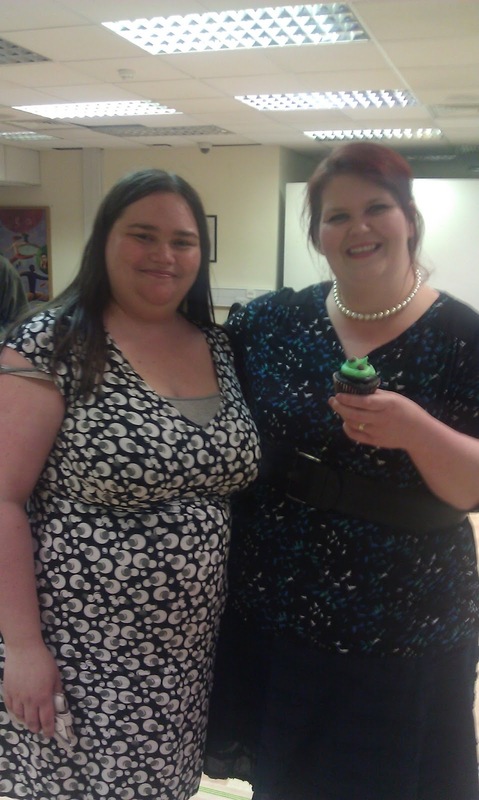 Me (left) and Ms Cupcake Mellissa Morgan. 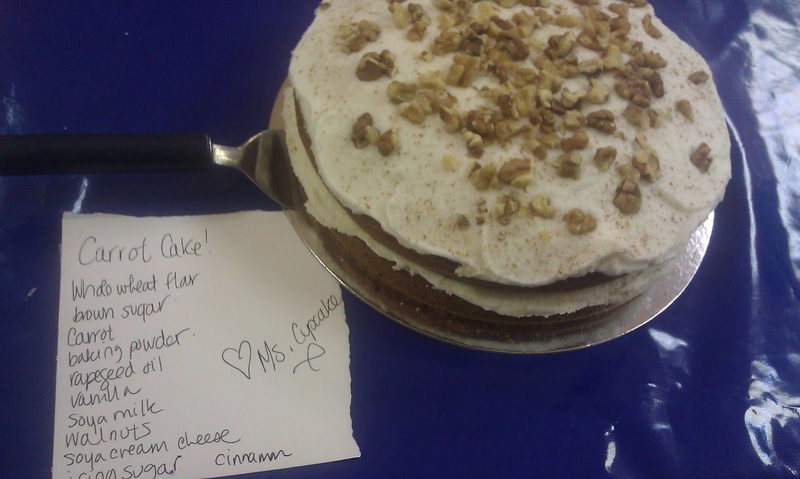 Ms. Cupcake is a south-London based vegan baker, originally from Canada. Her real name is Mellissa Morgan and her first recipe book, called "The Naughtiest Vegan Cakes in Town", has just been published by Random House. Ms. Cupcake started selling her cakes on a market stall in Greenwich and now has her own shop in Brixton, but I first discovered her at the annual environmental fair in the south London village where I live. Her cake stall looked so tempting and as I was there with a vegan friend we decided to try one of her bakes- it was awesome! I somehow came across a group called the London Vegan Meetup - given I'm neither vegetarian nor vegan I'm not actually sure how I originally found out about it. I saw that they were holding a potluck dinner one evening in London, and advertised that Mellissa would be attending and holding a book signing. My vegan friend was actually on holiday so I decided to venture along by myself - hoping desperately that nobody would find out or mind that I am a very happy meat eater! But I thought it would be a good way for me to find out more about vegan food and try some dishes - and I learnt that not all wine is vegan which had never occured to me before. 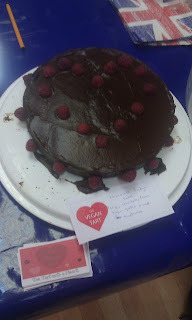 As it was a potluck, the idea was that everyone would bring a vegan dish to share - and to me the obvious choice was to make a cake from Ms. Cupcake's book. The carrot cake Ms. Cupcake made for the potluck. I had a slice and it was delicious! so taking cakes along to an event where other people would eat them was ideal! When I arrived one of the organisers came over to say hello and I told her what I'd made and that it was from Ms. Cupcake's book, and she immediately went and got Mellissa who came over for a chat. We spoke for several minutes and then I was staggered when Mellissa said she'd never actually eaten a cake someone else had made from one of her recipes. That put me under quite a lot of pressure and I was really nervous! Luckily, Mellissa really liked the cake and said it had an "excellent crumb". She was lovely and I was really pleased to have had the chance to speak to her - and her mum who was also there - and I'm thrilled to be able to say mine was the first cake she had tasted made by someone who had bought the Ms. Cupcake recipe book! 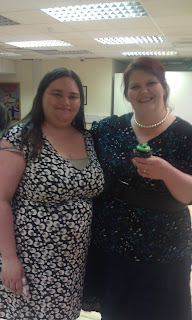 She even signed my book and wrote that my cupcakes were divine, which is pretty cool and very kind of Mellissa to say so. I also met some guys from a vegan bakery called the Vegan Tart, who made this awesome cake. They also have a stall in Brixton, where Ms. Cupcake is based, so I think I'll need to make a trip there soon! Here's an overview of how I made the cupcakes; I made some small adaptions and I'm not giving you the whole recipe here, you will just have to buy the book! Mix soya milk and vinegar and leave for ten minutes - it will start to bubble a little. Preheat oven to 180C. 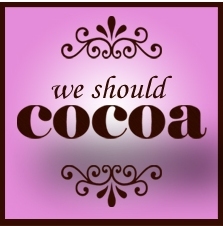 Mix flour, cocoa powder, sugar, salt, bicarb of soda and baking powder. Add the milk and vinegar, oil, vanilla and mint flavour and mix well. Some of mine sank a little in the middle; I discovered from the troubleshooting section of the recipe book that I had probably been too heavy-handed with the baking powder as this can cause cakes to sink. In the end this actually helped when I was piling the filling onto the cakes anyway! The book also has a recipe for the most amazing vegan chocolate spread which I've never come across before but it tasted fantastic. It only has three ingredients but I'm not telling you what they are, you'll have to buy the book! I spread the chocolate icing onto the cakes, taking advantage of those which had sunk a little in the middle so I could pile in the filling but keep the top fairly level. I then made some vegan buttercream using Vitalite which is vegan, though I didn't have as much left as I thought so I was unable to follow the exact quantities in the recipe. I flavoured it with peppermint and added a little mint green gel food colour. I piped swirls of the buttercream on top of the cakes, though it was a little softer than I would have liked, which I'm sure is because I didn't follow the recipe exactly. Ms. Cupcake's recipe uses vegan chocolate chips which don't seem to be that easy to get hold of - she suggested Wholefoods when we were chatting at the potluck. You could grate a bar of plain vegan chocolate over the cakes, or get these dairy-free chocolate buttons which are easier to find in supermarkets than the chocolate chips. I decorated the cupcakes with chocolate chips; they went down very well at the potluck and disappeared very quickly! I'm sending these to We Should Cocoa as the ingredient this month is mint. Victoria from A Kick at the Pantry Door is the guest host for June, on behalf of Choclette from Chocolate Log Blog and Chele of Chocolate Teapot. I'm also sending this to the Four Seasons Food challenge, hosted by Anneli from Delicieux and Louisa from Chez Foti. Their theme this month is picnic food and outdoor nibbles, and cupcakes are perfect for a picnic. Thanks Mellissa, you're too kind! It was great to meet you too. It sounds like you had fun. I am going to try these out on Graham. He is going to love them, bless his vegan socks! better pin it so I don't forget! Sorry I couldn't post the full recipe, I couldn't get permission from the publisher to print it all. You can always email/tweet me if you have any more questions about how I made them. lovely colour icing,they look really good.